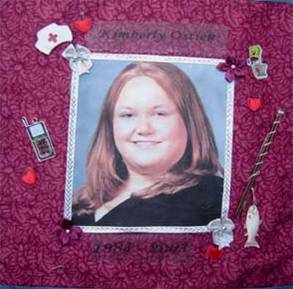 Kim’s Awareness is in memory of Kimberly Ostien who died from alcohol poisoning at 18 years old. In life, Kimberly aspired to be a nurse because she sincerely wanted to help others. A year and a half after Kim’s death, her family unveiled alcohol poisoning awareness cards – a tangible reminder of the tragic effects of alcohol. The Kim's Awareness Card is wallet sized and describes the signs of alcohol poisoning and what to do if you find yourself in that situation. The cards have already saved lives. Kim was a freshman at Neumann College in Aston, Pennsylvania when she died November 25, 2003. Although she was pronounced dead at the hospital, she actually died in her dorm room. According to the EMT report, Kim was not breathing nor did she have a pulse when they arrived. The medical staff tried to revive her for an hour before transporting her to the hospital. Shortly after arriving at the hospital, she was then pronounced dead. Had her friends or roommates known what to do, maybe Kim would be alive today. Many schools educate students, young and old, on drugs and alcohol. However, we feel it is necessary to get a stronger message out on the dangers of alcohol, especially excessive amounts consumed in a short period of time. Because binge drinking is common in many places, especially on college campuses, we hope to educate others on what to do when someone has too much to drink. Please read the card to find out what to do! Thank you for visiting Kim’s Awareness and we hope you will get the message out. Donations are graciously accepted and support the Kimberly Ostien Memorial Scholarship at Archbishop Prendergast High School. The 16th Annual Kymbo Golf Outing will be held on Saturday June 1, 2019 at Cobbs Creek Golf Course.